Last week two different news about how the two countries responsible for more than 40 percent of the global greenhouse gases emissions could sign an agreement in November and work together on greentech. To the New York Times a deal on climate change could be signed in November when President Obama will visit China. No doubt that such an agreement – with the right targets – would be a huge boost to discussions in Copenhagen. 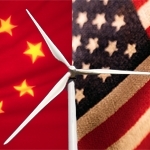 Concerning cleantech, TreeHugger reports that the Chinese government launched an initiative to pair American technologies and Chinese manufacturing. The potential size of the market for greentech, says the report, is between US$500 billion and US$1 trillion annually, or as much as 15% of China’s forecasted GDP, in 2013. As an example of this, CleanTechies reports that the Chinese wind energy capacity has been doubling each year for the past five years and could meet all the energy demands of the country until 2030. This sure is good news, but this will require a huge commitment. Another major news from China reached my RSS reader as to Ecogeek, China is planning the world’s largest solar project. With a capacity of two Gigawatt the project is a perfect example of what US and Chinese companies can do when they are partnering on cleantech. All this is good news but we shouldn’t forget that the energy consumption is increasing very fast in China – around 15 percent per annum. One of the main consequences is that parts of China already have per capita greenhouse gases emissions equivalent to rich nations like France. The fact was presented by the famous economist Lord Nicholas Stern during a conference in Beijing. I am more and more confident that this is only the beginning and that something significant will occur in Copenhagen as more and more countries seem to understand the benefits of climate change mitigation and the risks of inaction.